The Alpha USB is a state of the art solution for getting music out of your computer-based server and into your DAC. 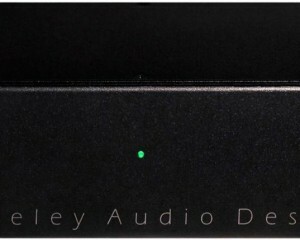 Berkeley Audio wanted to create a product that allowed anyone, not just those with technical expertise, to realize state-of-the-art computer-based audio performance. To accomplish this, their engineers have taken extensive measures to isolate the two “halves” of the Alpha USB to insulate any computer generated noise from its clean digital output. The USB side is powered by the computer’s USB bus while the clocks and digital-audio output drivers are powered from the Alpha USB’s own linear power supply. Selectable audio output signal types are either coaxial SPDIF using a BNC connector or balanced AES using an XLR connector. Sampling rates up to 192 kHz and word lengths up to 24 bit are supported. Apple Macintosh computers using Snow Leopard or later operating systems can connect directly to the Alpha USB without any special driver, while Windows operating systems require the included Alpha USB Windows driver which works with Windows XP, Vista and 7. The unit also works with some versions of Linux. 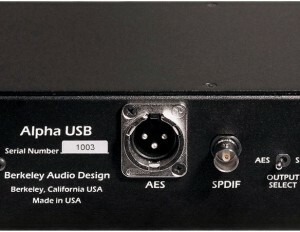 The Alpha USB is an asynchronous High Speed USB to digital audio interface that extracts the highest possible audio quality from computer audio sources. Two key factors combine to achieve the excellent audio performance of the Alpha USB – the unprecedented degree of electrical isolation between the USB input connection and the audio output and the very low noise/low jitter performance of the individually tested audio output master clocks.